Solar PV panels , Billericay Essex. 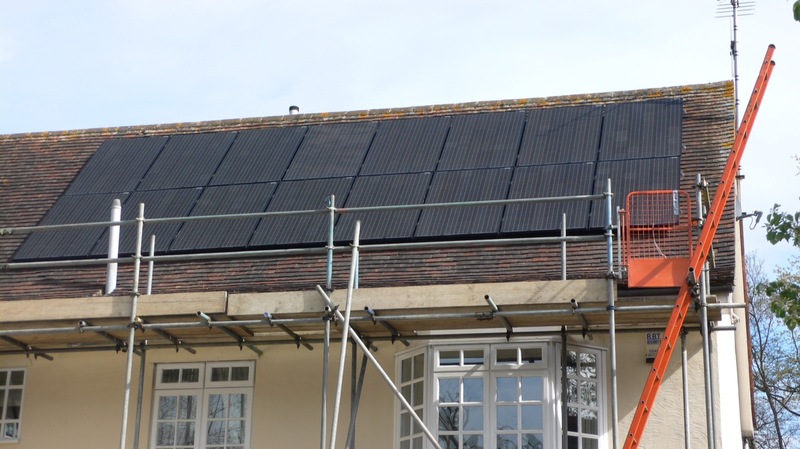 Black monocrstaline solar pv panels on a composite slate roof. MCS certified installation and qualifying for government FIT payments. 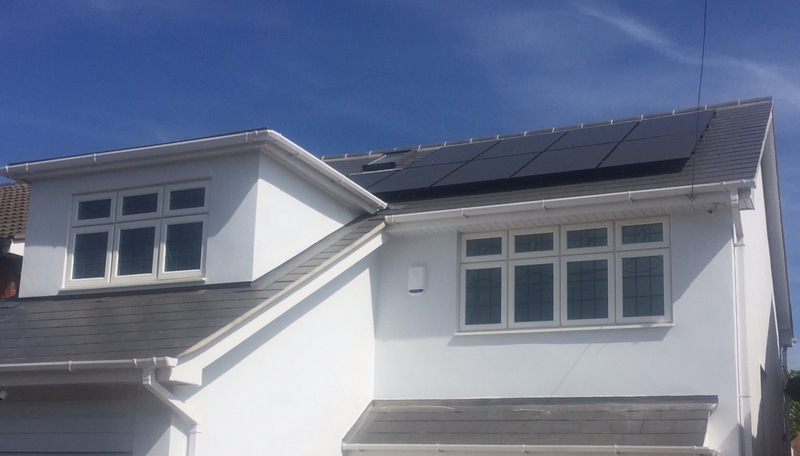 PV Renewable Energy design and install renewable energy solutions for domestic and commercial properties accross Essex, London and surrounding counties. PV Renewable Energy ltd install solar pv systems , airsource heatpumps (ASHP), airconditioning and air to air heatpumps . PV Renewable Energy Ltd are Panasonic Pro partners for the Aquarea range of air to water heatpumps. We can provide MCS certification for Renewable Heat Incentive (RHI grants) applications. We install in areas such as Billericay ,Chelmsford, Hutton,Shenfield,Colchester and Bishops stortford. 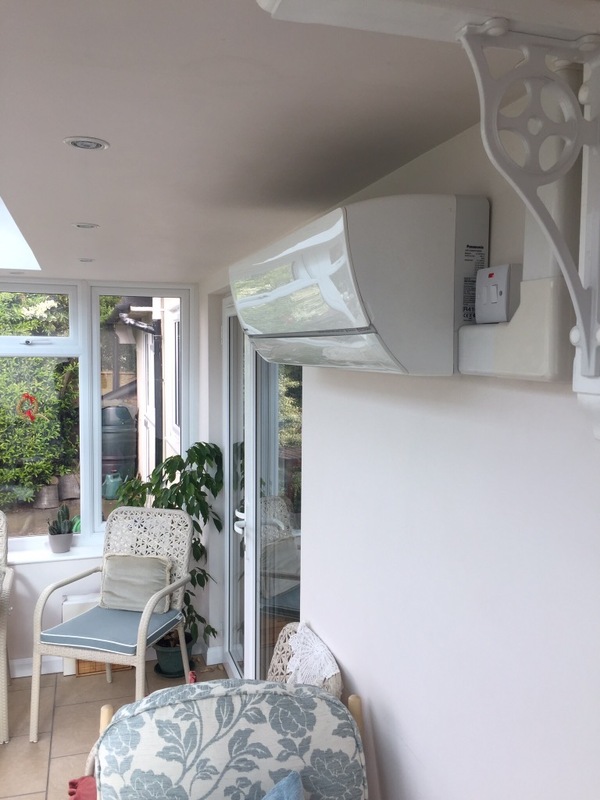 Panasonic Etheria Airconditioning installed in a conservatory in Chelmsford, Essex. This unit as a noise level down to 20 db with anti mould and bacterial filtration. PV Renewable Energy Ltd install air to air heatpumps (ashp) and airconditiong in Harlow , Romford, Southend, Essex, Hertfordshire and London. We are Mcs accredited for Airsource Heatpump (ASHP) and Solar PV panel installations. Fit and RHI payments are available on qualifying installations. Conservatory air conditioning and heating in Chelmsford, Essex, Hertfordshire Kent and London. 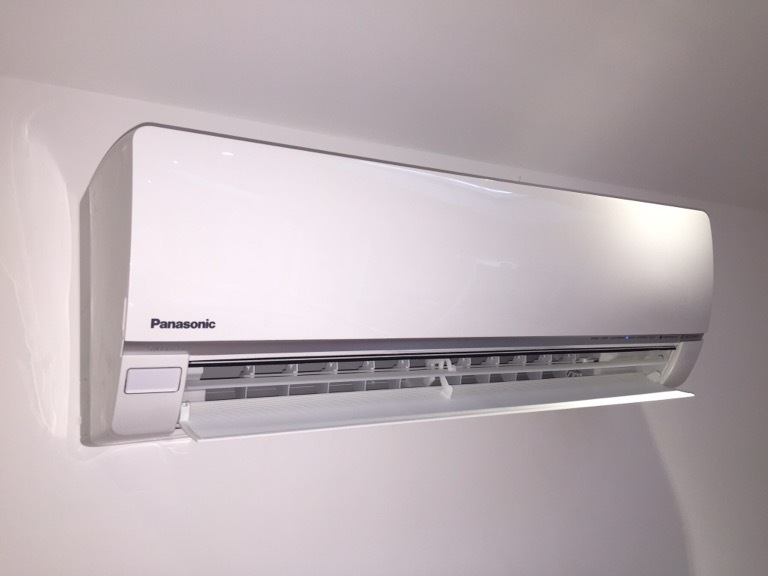 Air to air Heat pump and airconditiong . super quiet at 20 db in low fan setting. PV Renewable Energy ltd design and install Airconditiong solutions for the consevatory and home, we are also MCS accredited for Air to water heatpumps (ASHP) and can certify for RHI payments abd subsidies. PV Renewable Energy ltd install conservatory airconditioning in locations such as Chelmsford, Colchester, Brentwood, Essex , Hertfordshir, Kent and London. Solar PV panel repairs Billericay Essex. MCS registered. Solar Flash installed with Renusol anchors and Rail. Solarflash roof anchor flashings work well with eternit and slate tiles for newbuild and retrofit. Repacement solar PV panels are Solarworld 285 watt all black monocrystaline. 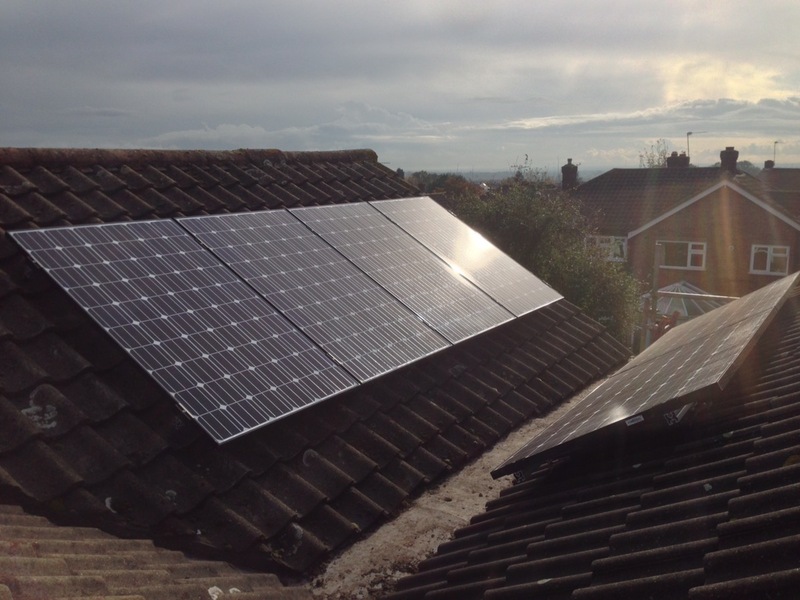 PV Renewable Energy ltd install repair and maintain solar panel installations in Essex , Hertfordshire, Kent and London. Solar Panel flat roof installation, Chelmsford. Flat roof Solar Panel installation , Chelmsford Essex. 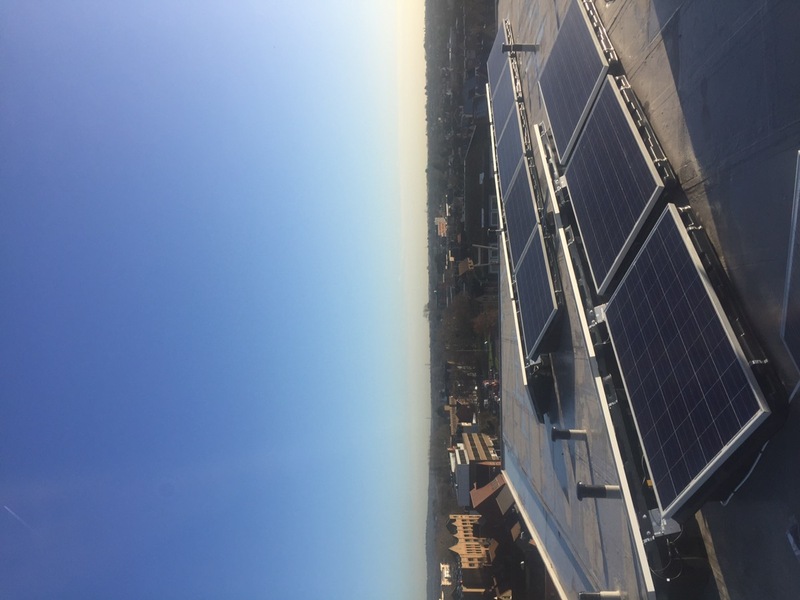 This is a flat roof top above 3 penthouse apartments , the SAPS required that renewable technology was installed. Each property is grid connected to a 2.5 kwp solar array. The solar panels are secured using the Renusol Console ballasted tub. Panasonic ceiling mounted airconditioning , Colchester. 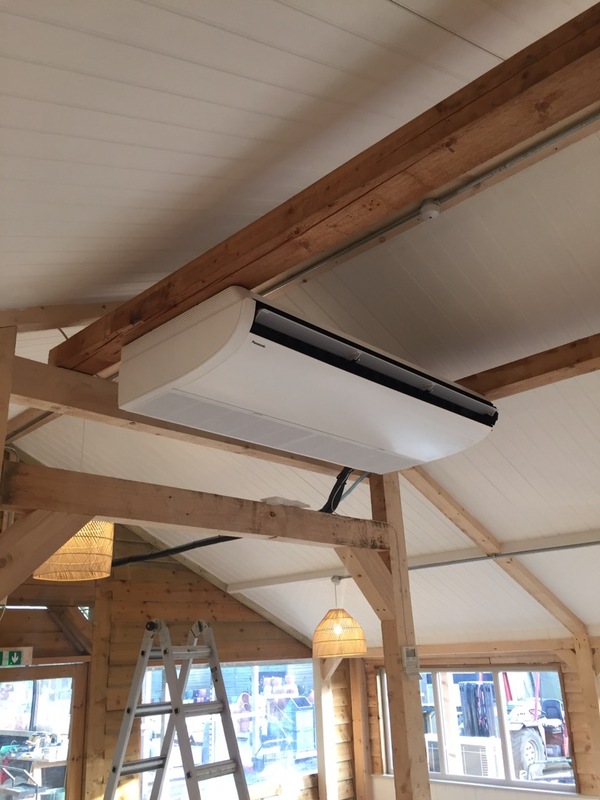 12.5 kw airconditioning unit providing heating and cooling to a garden centre tea room in Colchester, Essex. 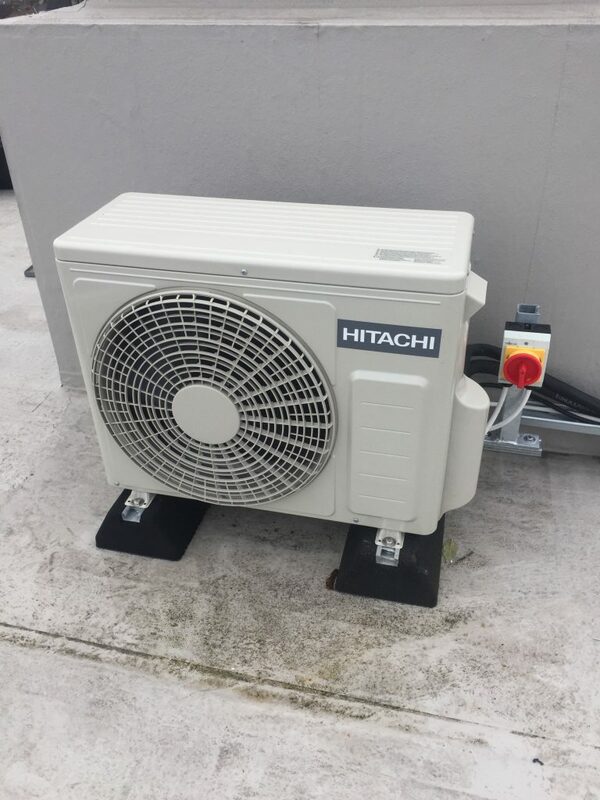 Pictured is a Hitachi Air to Air Heat Pump on a roof top above a penthouse apartment in Chelmsford, Essex. 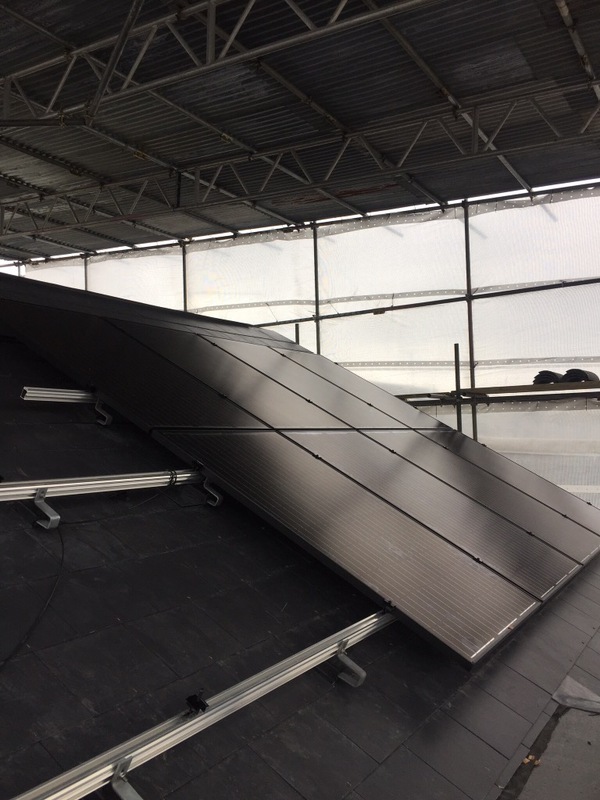 This provides 3.2 Kw of heat at an ambient temperature of 6 C.
Lg solar PV panel installation in Shenfield , Essex. 16 x 250 watt lg black Solar panels . 12 year Product warranty. SMA sunny boy 3600 dual tracker inverter . PV Renewable Energy install solar PV panels in Shenfield , Hutton , Romford , Upminster , Essex and London. Lg solar PV panel installation , Colchester , Essex. 26 x lg 285 watt solar PV panels. Rooftop installation in Colchester, Essex. 12 year product warranty on the LG solar panels. 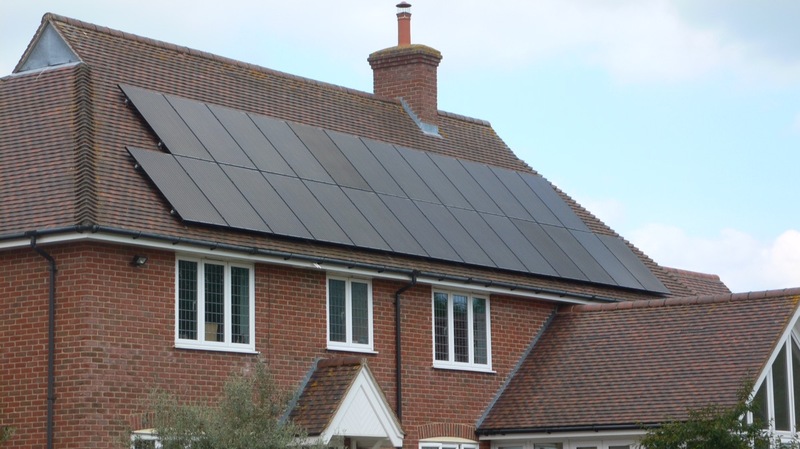 PVRE ltd design , install and maintain Solar PV systems in Colchester, Chelmsford, Essex Hertfordshire , London and the South East. Solar photovoltaic installation, east west , LG neon black frame panels. PV Renewable Energy Ltd install PV systems in Brentwood, Romford , Upminster, Essex and the south East .